FAMILY, FRIENDS AND SUPPORTERS OF CASA MARIA AND THE TUCSON BUS RIDERS UNION PLEASE JOIN US ON WED. FEB. 19TH AT 4PM AT CITY HALL TO SAY NO TO FARE INCREASES! Come to city council to say NO TO FARE INCREASES! The city should not balance the city’s budget on the backs of the Bus Riders in this, the 6th poorest city in the United States. 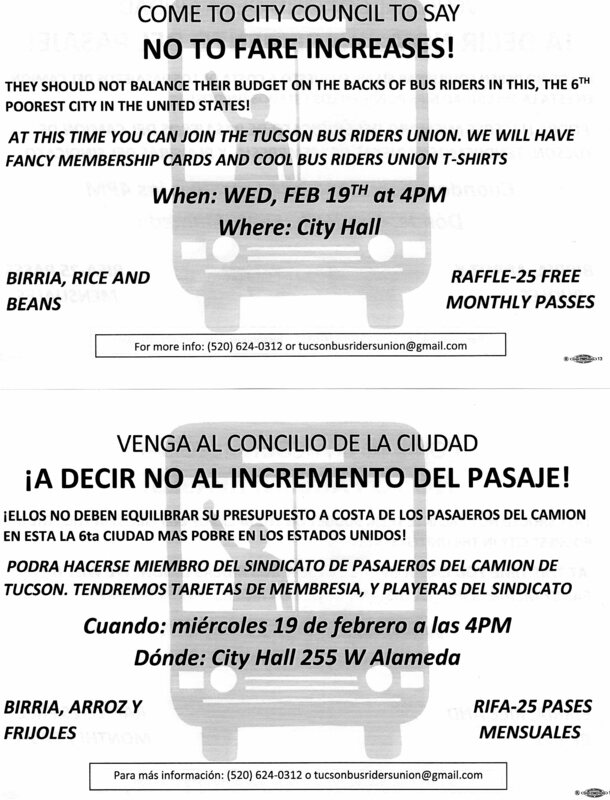 Come Join the Tucson Bus Riders Union on Feb. 19th and get your official membership card and a Tucson Bus Riders Union T-shirt. There will be mouth-watering food and raffles for free monthly bus passes. Also, please check out Brian’s Op-ed in the Arizona Daily Star on the subject to be better informed (http://azstarnet.com/news/opinion/brian-flagg-tucson-has-a-moral-imperative-not-to-raise/article_821ed785-8e70-5a71-8fe8-d484f718a827.html).